When we talk about smoothies, we are referring to the action of blending whole foods such as fruits, vegetables, seeds, herbs, and nuts in a high power blender. Blending is not the same as juicing. 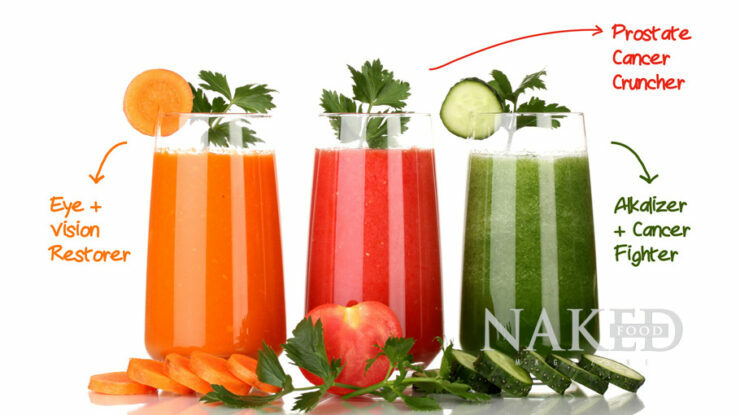 Although juicing has become a very popular way of extracting certain parts of food into a liquid form for easy consumption, juicing is not a complete food nor is recommended on a daily basis. Most phytonutrients are located in the skins, seeds, stems and rinds of the food. When food is juiced, the main food nutrients are discarded. Of all the phytonutrients, we probably know the most about carotenoids, the red, orange and yellow pigments in fruits and vegetables. Fruits and vegetables that are high in carotenoids appear to protect humans against certain cancers, heart disease and age related macular degeneration. 2 carrots, 1 peeled orange with white pith, 1 orange bell pepper with seeds, 1 node of parsley, 1 fuji apple with skin and seeds, 1 cup of distilled water. 2 organic plum tomatoes, 5 organic strawberries, 1/4 cup of goji berries, 1 node of parsley, 1 fuji apple with skin and seeds, 1 1/2 cup of distilled water. 1/2 organic cucumber with skin, 2 stalks of celery, 1/2 lime with white pith, 2 swiss chard leaves, 1 node of parsley, 1 fuji apple with skin and seeds, 1 1/2 cup of distilled water. How do phytonutrients protect against disease? *The Phase II enzyme enables the detoxifying process. Every cell in our body has been granted with a self-healing device called Phase II enzyme. This process enables cells to detoxify themselves from chemical waste and toxins; however, this process is possible when it is stimulated by phytonutrients. Phytonutrients act as keys that fit into cell receptors and activate the process. One of the most powerful phytonutrients is glutathione, which is found in asparagus. Phytonutrients are found in the cellulose fiber of whole foods such as skins, rinds, seeds, stems and pulp. The sole basis of a comprehensive plant-based diet is to eat the whole food; however, there are some obvious parts of foods we don’t consume like the pineapple skin, for instance. Blending vegetables and fruits together allows the many nutrients of the food to be absorbed by the body in a more efficient manner. When Mahatma Gandhi said “Chew your drink and drink your food,” he was stressing the scientifically proven benefits of chewing. Inadequately digested food means inadequate absorption of nutrients. The leptin, ghrelin, and cholecystokinin hormones, which are responsible for signaling satiation, don’t reach their peak until 20 to 40 minutes after food is ingested. Speed eaters beat their body’s signal keepers by wolfing down their meals. To make matters worse, poorly chewed food particles are not welcome in the stomach. Sloppily chewed food promotes intestinal bacteria, causing flatulence, bloating, constipation, stomach ache, cramps, and even diarrhea. One apple for example contains more than 385 phytonutrients. That is again, one apple. Man-made vitamins are meant to extract (just like juicing) one or two beneficial properties of a whole food, mainly to attempt to concentrate the nutrient; however, nutrients don’t work as separate machines, nor does nutrition. Nutrition, per se, is the conjunction of all nutrients working and interacting with one another as a perfect symphony. Think of it as a wonderful piece of music in which every instrument plays a key part. All together they create a perfect balance of nutritional components for your body, so extracting one simply leaves out the other 384 phytonutrients that the body was meant to receive. The blending of whole foods not only constitutes a perfect way to increase the intake of vegetables and fruits on a daily basis, but it can also be a fulfilling one. Due to the fiber content of whole foods (only whole plant-based foods contain fiber), a blended vegetable/fruit smoothie is a great tool for weight loss. The key to satiety is eating fiber-rich foods that fill the stomach from a volume standpoint, and that have enough calorie density to satisfy the nutrient receptors. Humans have built-in mechanisms for figuring out exactly how much to eat without calorie or nutrient counting. These are stretch receptors in the stomach that detect when the stomach is filled with food, and nutrient receptors that detect the nutrient density of the foods consumed. Fruits, seeds, nuts, and vegetables fill the stomach, and with few calories, satisfy the nutrient receptors. On the contrary, calorie-dense and processed foods are addictive. They have the same effect on the dopamine receptors in the brain as drugs like heroin or cocaine. Asking anyone to control his or her intake of these foods using willpower is a recipe for failure. 1 cup organic kale, 1/2 lime with pith, 1 organic kiwi, 1 fresh parsley top, 8 green organic grapes, 1 banana, 1 shot of wheat grass, 1 Tbsp. hemp seeds or hemp powder. Although already packaged drinks sold as healthy smoothies may sound like a good option, beware of the ingredient list. The best possible scenario is to blend the smoothies in your own kitchen. This will allow complete control of what goes in the blender and will not include any of the preservatives of packaged drinks. A powerful homemade smoothie may take from 5 to 10 minutes to make. Blending is not a replacement for eating regular whole foods directly, but a complementing way to increase the intake of whole foods in the daily diet. cleaned thoroughly with a fruit/veggie wash. Porous produce must be organic. Strawberries for instance, have tiny holes on the surface without a protective membrane; therefore they absorb the pesticides deep into their flesh. Other whole foods heavily sprayed with pesticides include peppers, celery, apples, cherries, cucumbers, grapes, lettuce, peaches, spinach, tomatoes, and berries. – Blenders: Not all blenders are created equally. Regular household blenders do not puree food as intended, so we recommend the Nutribullet ($119.94 Nutribullet.com), a 3 horsepower blender from Vitamix (Vitamix.com), or a 3 horsepower blender from Blendtec (Blendtec.com). Written by Margarita Restrepo. 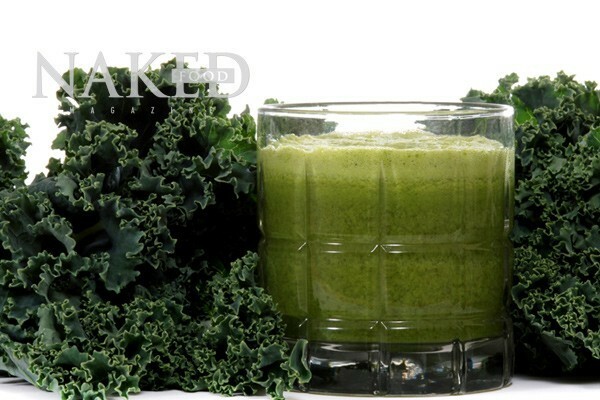 All smoothie recipes developed by the Naked Food Chefs. Have a plant-based smoothie recipe? Share it with us! When you say : “most phytonutrients are located in the skins, seeds, stems and rinds of the food. 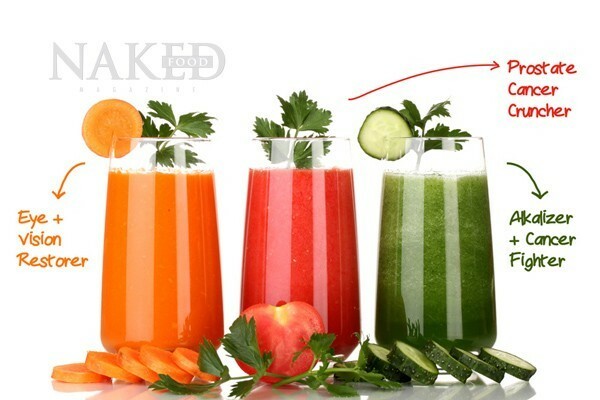 When food is juiced, the main food nutrients are discarded”. And the ONLY thing left over is the fibre. There is NO nutrition in fibre. I was looking up the vitamix on their website and can only find 2 HP models but you mention to use a 3 Hp model in this article. I was just wondering if this was a misprint. Thanks. So are these smoothies for individuals that eat lots of meat and/or diary. If an individual generally thrives on a WFPB do they really need to drink these on the regular. I just started blending kale and spinach, with frozen fruits(strawberries,papaya, mango etc. I really love this smoothie on mornings. I am not able to discern the healthful benefits at time. i will continue to blend this smoothie, because I know it is good for me. Have breakfast as a king, lunch as a prince, and dinner as a pauper. I believe you are right on track with your smoothies Elton. I do the same thing you do however for the liquid, I use coconut water and acai juice (organic). I also throw some nuts in mine. Try that as well. What a great article! I juice and blend almost daily and I learned tons of useful information in it. Thanks for sharing and making it easy to understand phytonutrients. what is a “node of Parsley”? Dan, a node is the small branch of leaves that grow from the stem. (Node: The point on a stem in which a leaf or leaves are inserted). Interesting article and GORGEOUS pics. I just wanna drench myself in these vibrant smoothies! I’ll settle for giving my insides a good cleansing instead. Looking forward to trying these recipes. 1 – Blending the avocado PIT?? I’ve not heard of that before. Could you provide a source about the safety of ingesting this part of the avocado? 2 – Goji berries: Where would you find these? They seem pretty expensive from a brief internet search. I think I’d just substitute them with more strawberries or some other red fleshed fruit. 1- Avocado pits are full of nutrients such as anti-oxidants, soluble fiber among others. 2- Goji berries can be found in your local farmer’s market or whole foods market. You can replace goji berries for other berries, however, they are a concentrated source of nutrients and are labeled a superfood. The goji, a Himalayan berry, has inspired a surge of interest for its use in treating diabetes, hypertension, malaria, fever, cancer and other ailments. Gram for gram, goji berries pack more vitamin C than some oranges and more beta-carotene than carrots.